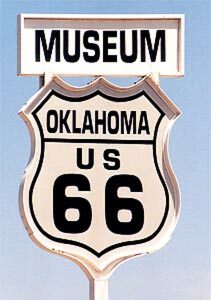 During a recent trip on historic Old Route 66, our first stop was in Clinton, Oklahoma to see the Route 66 Museum, which does a fine job of chronicling the rise and fall of the legendary “Mother Road” from Chicago to Los Angeles. It was a real “kick” to learn about early automobile travel… see how the highway, completed in 1938, was built with horse-drawn graders… and observe how Route 66 became an American cultural icon even though it was decommissioned and replaced by I-40 some 20 years ago. Clinton is in western Oklahoma on U.S. Highway 183, just north of where it meets I-40, roughly 85 miles west of Oklahoma City. The museum (2229 W. Gary Blvd.) is open from 9 a.m. to 7 p.m. Monday through Saturday and 1-6 p.m. Sunday from May through August; it closes earlier the rest of the year. For details, call 1-580-323-7866.